Joel Osteen Ministries | Byron Howell Ministries, Inc.
On Friday we went to A Night of Hope presented by Joel Osteen Ministries. It featured Joel and his wife Victoria (and some other members of the Osteen family) encouraging people to draw closer to God and have faith that God has good plans for our lives. The event also featured some great Christian music. Previously I hadn't thought much of his ministry. It's not that I disliked him or thought he wasn't a genuinely anointed man of God, but I just felt it wasn't really for me. I'd like to discuss that and show you why His ministry is actually great for me, and why it would be great for you too. When you see Mr. Osteen on television you see this smiley Texan talking about how God loves you and only has wonderful things planned for you. Some find this encouraging, others find it nauseating. I've heard many criticisms of him and his ministry. I believe the most potentially valid criticisms concern his not discussing sin and the importance of holiness. Now I haven’t heard many of his sermons. I really don't know what all he preaches about and I doubt most of his detractors do either. But he certainly seems to focus on all the good God wants to do for you. He does focus on your part in terms of faith and hope, but he doesn't talk much about the need to truly lay aside the sins that beset. I completely agree with him that God has wonderful plans for all our lives. The revelation of God as my father convinces me of this. But although God has great plans for us all, many people won't see them. If you continue in sin you won't see much or any of God's plans for your life. If you are out of the Word or out of Christian fellowship, you can forget it. I also felt his message somewhat juvenile. I thought to myself, "God has a wonderful plan for me. Great. I've heard that before. Tell that to the unsaved." I felt like I needed something more, something deeper, some great revelation. But I realize now that his message is not juvenile. The Word he preaches is not all "milk." And in fact, if truly committed Christians would hear him and apply his Biblical teachings, it could truly take them to the next level and help them experience all God has for them. I actually believe that although his ministry largely appeals to the unsaved and immature, his message is mostly for the mature. His words would do the most for the devout and the learned. And if you've written him off for the above reasons, I encourage you to think again. The devil wants you to think it's beneath you, but it's actually perfect for you. Let me explain further. What are the three eternal things? Faith, hope and love, right? Well we generally know faith and love, but I believe many lack hope. The actual meaning of "hope" is "confident expectation." If I'm saying that I hope Jesus returns, that means I confidently expect His return. But we have made "hope" something else. We have introduced the element of chance into "hope." When someone uses "hope" we basically translate it as "want." You see, Joel Osteen's ministry (at least it seems to me), is about stirring up your faith and hope that God loves you and will take care of you. And I believe this ministry is sorely needed in the Body of Christ. We know the Word, we have faith in the Word, but we have not confidently expected all God's promises to manifest in our lives. I don't know about you, but my mind has been trained to say "What if" and then give me some negative possibility. What if the car breaks down? What if I can't pay the bill? Christian, I tell you right now that we must stop that. Rather, we need to confidently expect all of God's promises to manifest in our lives. God meets all our needs. God rebukes the devourer for our sakes. God makes all grace abound towards us. Believe in and expect these realities for your life. It's time we eschew all thoughts of negative possibilities and replace them with expectation of Godly-good-certain-outcomes. "God is going to help me pay my bills this month." "My car is going to last another 100,000 miles." Whatever situation you are facing, find God's relevant promises, and begin expecting them to come to pass. I believe there is a law of expectation. Job said that which he feared came upon him. If you fear or worry over negative possibilities, you are drawing them to you. And you are not demonstrating faith in God's Word to provide for and protect you. Conversely, if you are constantly expecting God's goodness and grace and favor, you are going to experience them in every area of your life. Now I know Joel Osteen's ministry is much more than just hope and expectation, but I believe that is a crucial Word for the Body. I know we hear that from other Godly men and women, but you hear it from him loudly and constantly. I believe God is using him to usher in a new level of faith and hope in the Global Body of Christ. I need this ministry. I can't have negative thoughts if I'm going where God wants. I need to be filled with trust in and confident expectation of God's goodness for my life. "This is written: that he that ploweth should plow in hope; and that he that thresheth in hope should be partaker of his hope (1 Corinthians 9:10)." Whatever you do, confidently expect God's blessing and results. God has a good plan for your life. If you will seek God's will for your life and begin expecting God's blessings to come upon you, then it's going to happen. 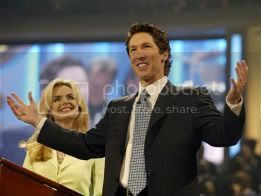 I'm not saying you need to hear every sermon Pastor Osteen preaches, but I encourage you all to hear him regularly, to ensure your hope level stays high, and to ensure you are constantly drawing God's positive possibilities to you. I also encourage you to attend A Night of Hope if you can. The other day I went to look up a scripture on Biblegateway.com and I use Google as my search engine. Anyhow, "Exploits For God" came up and I thought "Could it be"? Well it was... YOU!....so I added you as my favorite and I have visited you a few times. That being said....I enjoy your blog very much. I also agree with you on Osteen....What a wonderful man. He is reaching the unsaved, unlovely and the Hopeless.....we may be bit more "seasoned" in our walk , but we always need to hear about Hope Faith and Love.....the encouragement to keep going.